The Tale of the GWR Railcar .... 2006 to 2015 (or perhaps 2016). Re: The Tale of the GWR Railcar .... 2006 to 2015 (or perhaps 2016). 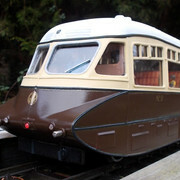 The horns ordered in 1939 were fitted to cars No.19 onwards, which would have included No.22. This thread (which was aimed at helping anyone building one of these kits to get the detailing correct, without having to spend hour upon hour searching though books and websites) has transformed into a discussion on whistle and horn sounds. Each railway company and CMEs of those conpanies fitted whistles which were distinctive in their sound. Now soundcards are being widely used, it would be useful to have a library of reference files to help "tune" those cards to suit the loco. Bob has the horn sounds for the Swindon railcars, has anyone else here any steam whistle (or air horn) recordings taken from specific loco classes, which they would be willing to upload to a G3 Wiki resource library? As a novice on such matters John, are you meaning purely for interest’s sake that we can then listen from the site, or do you have in mind that clever people can download such to their own sound card and use in their own locos? If the latter is possible then a blow-by-blow account of what equipment would be needed, including the sound card itself, and how to approach the task, would be a very useful source. The only sound recording I have, as an example of what many probably have too, is a soundtrack on my iPhone of a Peak Sulzer idling. My initial intention had been to use files to tune "by ear" the generic sound cards (e.g. the MyLocoSound cards which I use in all my locos) but if someone with the time and expertise wishes to do the "homework" to provide a circuit diagram for a card to accept such recordings, then that would be a good addition to the G3 Wiki. But would something like this in 16bit CD quality be of interest? This is a very old project for Digitraxx made almost a decde ago. "You don't know what you don't know"
There is a cheap sound chip card on Amazon for £1.50. That could be all that would be needed for a horn. Re: The Tale of the GWR Railcar .... Hoorah ....... (only 13 years late)! It has been at least 13 years since I first started on this kit and there was a time when it was causing so many problems that it was almost abandoned. However, it has been completed and was today given its first outing on the track. It performed faultlessly, to my surprise, considering all the trouble it had caused, including replacement motors. The MyLocoSound "Universal Diesel" card which has a wide selection of engine and horn sounds (including the Klaxon, which I needed and a diesel mechanical railcar with gear change option) gave credible performance, including brake "squeal" as it came to a halt. At first I thought it was mechanical noise from the bogies but on re-reading the programming instructions, it does have a multiple selection brake option which I had not disabled and will leave "on". No.8 glides across the viaduct displaying "express" headcode. Brought to a stand at wayside halt by signal check. On its way again towards the terminus. 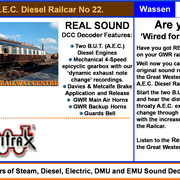 Re: The Tale of the GWR Railcar .... Sound Card. Since my previous post, I have suffered a sound card "burn out". Peter Lucas has looked at problem and confirmed that a voltage spike from the motor circuit has caused the problem. The card is being replaced under warranty but I am anxious to avoid a repeat (there were two yellow flashes followed by burning smell and I had to partly dismantle the car to extract the card). Peter's engineer has advised fitting a Transient Voltage Suppressor (TVS) diode across the card terminals M1 and M2 (the input from the motors) which will absorb any surges and protect the card. The Stock No. from RS Components is 486-4274 "STMicroelectronics 1.5KE24CA, Bi-Directional TVS Diode, 1500W, 2-Pin DO-201". I have not had any similar problems in the past (the railcar is my only model with more than one motor) but I shall be fitting this protection to all my cards in future. That "Flying Banana" - Filling that Hole! Having replaced the burnt out sound card and refitted the roof, I then turned my attention to something else which had been nagging at the back of my mind. 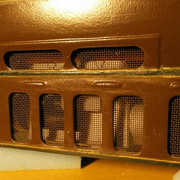 The ventilation for the engine compartments is of wire mesh but on the model there was just a gaping void behind the mesh; you could see right through to the other side! 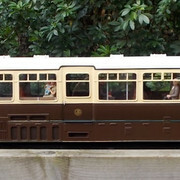 I had already ditched the very coarse mesh supplied with the kit in favour of finer, etched brass, mesh and something had to be done about the "see-through" engine compartments. Initially, my intention had been simply to "blank" internally with plain, black-painted, plastic card. After again looking at the drawings and photos in Colin Judge's GWR railcar book, I decided that the aluminium colour of the pair of AEC/Ricardo (London bus) engines which powered these railcars would look much better but not painted on a piece of card! Next task was to make a pattern for a low-relief model of the engines and cast them in resin. They are not finely detailed but are of a reasonably accurate outline of the engines which, when the light catches the aluminium paint, will be visible through the mesh. If anyone wants to improve their model with a couple of these castings, they are available for the cost of the postage. 1) General view showing ancillaries in black (dynamo and vacuum exhauster) and pale grey (fuel pump and injector control) remainder aluminium colour. 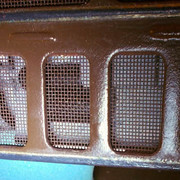 The rocker covers (with the AEC trademark inverted triangle) can be seen in through upper grille. 2) Closer view showing water cooling fan and exit from radiator duct. When Mark Thatcher came to take photos of the Sentinel "Plantagenet" for a "Garden Rail" article (due April/May) he insisted on playing with my "Flying Banana". He has had a similar (but track-powered example) for several years and has been wanting a radio-controlled/battery railcar, so I offered to convert his. At the same time, I "upgraded" it in other areas with new resin castings and other additional detailing. The modifications included making new bogie cover fairings for one side since, for the purposes of a "Garden Rail" review some years ago, he had cut away and discarded the fairings on one side.... hence the unpainted areas. Mark has the remnant of the spray can of Railmatch paint he used originally, so will be respraying the affected areas tomorrow.